Okay, so it's a nostalgic subcompact in the U.S. However, the Justy lives on in other markets. In fact, today Autoblog had a story about a new edition of the Justy with stripes and other goodies (thanks for the link, Craig), which made me think about this old little mountain goat of a vehicle (see below for a link to the Autoblog story). You may or may not remember the Subaru Justy. 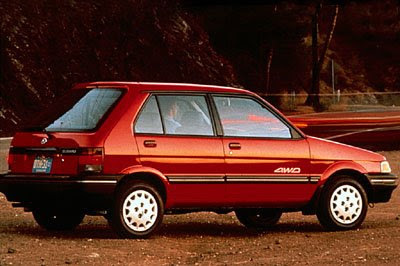 It was a tiny FWD or 4WD subcompact offered during the late 1980s and early 1990s. It had either a tiny carburated 1.2-liter 66-horsepower three-banger, or a fuel-injected 73-horsepower 1.2-liter three-cylinder engine, and got pretty good mileage for what it was (32/37 for the carbed FWD; 25/29 for the fuelie 4WD). It also went the way of the Daewoo Dodo in the U.S. in 1994. In addition, it was one of the last carburated cars offered in the U.S. I still want one. 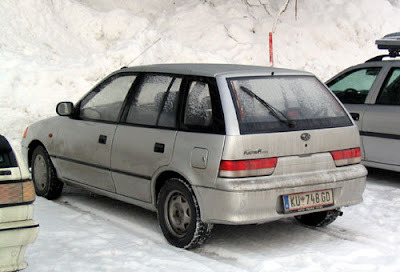 The second generation Justy available out side of the States from 1995-2002, was an AWD version of the Suzuki Cultis/Swift, AKA the Geo Metro in the U.S. It was powered by a 1.3 liter gas engine. I photographed the one at the right while in Germany in 2006 . 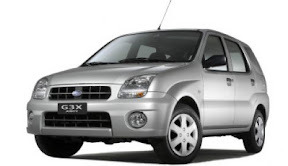 The third-generation Justy known as the Justy G3X (2003-2006), was based on the second-generation Suzuki Ignis, aka the Chevrolet Cruze, and had a 98-horsepower 1.5-liter four cylinder engine. The latest iteration of the Justy, released in 2007, is a rebadged Daihatsu Beef Sirloin Sirion and features a 69-horsepower 1.0-liter three cylinder. 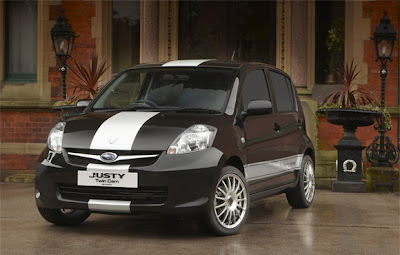 Today, Autoblog had a mention about how there was a limited-edition Justy with stripes. See the link to the full story in the link below. I bought one of these brand new in 1988! It had over 225,000 miles on it when we finally got rid of it. It still had the original clutch and never had anything other than routine maintenance done to the engine and transmission. It got 39 mpg to the very end. The bad news? The suspension and interior were falling apart!! Oh, well...nothing's perfect.